Women’s reproductive health can be pretty complicated and it’s good to keep track of things. Whether you’re planning a family or just want to know when your period is coming, there are a number of great period and fertility tracking apps to choose from. These apps are much more than period trackers. They’re reproductive health helpers and can help you plan your baby delivery. We have found and reviewed an excellent pregnancy app for Android users, so read on and learn everything about Baby Delivery Planner. What is Baby Delivery Planner? 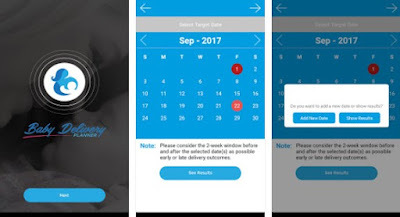 Baby Delivery Planner is a free, user-friendly and handy conception pregnancy app for all expecting parents that want to easily target specific birth dates. This Android tool is perfect for couples that either want to give birth on or want to avoid giving birth on a particular date. Let’s see how it actually works. First of all, let us give you a simple example so you can understand the way this app works. Say you want to deliver on or avoid delivery on Christmas. Select that date on the app’s calendar and wait for it to make its calculations. Then, it will inform you when you should attempt to conceive. This way, you will be able to avoid or target specific dates. Avoid giving birth during expected severe weather such as winter storms or very hot summers, avoid conflicting time frames and make a detailed plan around the baby delivery. Don’t forget to consult your doctor about ideal delivery outcomes for your health and plan medications around your baby delivery date before making the calculations with the app. Baby Delivery Planner stores your personal info on your phone, not on the cloud, plus it lets you plan out conception dates for years in advance if desired. You can download it immediately from the following Google Play link – it’s totally free of charge!